Whether you’re looking for an OE replacement air filter or you’re planning the air intake system for a ground-up custom car build, Spectre Performance has the high quality, high performing components you need. Spectre Performance offers a complete line of air intake systems, air filters, and performance accessories that will meet the needs of the most demanding automotive enthusiast. These Spectre vehicle specific cold air intake kits are an easy way to add performance to your stock late model car or truck, hot rod or classic muscle car. Designed to be a direct fit bolt-on replacement to the stock intake system, installation can be quick and easy. Manufactured from high quality polished aluminum tubing, each system is designed to give you an added increase in performance by routing the intake inlet away from heat sources like the radiator and headers. Powdercoated heat shields, where applicable, can also help prevent hot air from entering the intake inlet. Available with Spectre HPR air filters engineered for increased flow for greater performance. Find vehicle specific air intake systems using our vehicle search tool. Chevrolet has made it a relatively easy task to install one of its modernized LS crate motors into classic Chevy models from the early 1960s through the early 1970s. The LS provides modern driveability with more power and surprisingly better fuel economy in most cases. However, one area left for the installer to develop his own solution is the air intake system. For this reason Spectre has designed LS engine intake systems for certain model years of the Chevrolet Biscayne, Caprice, Camaro, Chevelle, Impala, Nova, and C/K pickup. These LS-specific air intake systems are available in several different configurations, taking into account the model, engine, and mass airflow sensor configuration. In addition, each air intake features one or more heat shields to keep hot underhood air from contaminating the cool intake flow. Spectre’s universal air intake systems are designed for muscle car and truck owners seeking to increase the performance of their rides. Heat rises, so the standard air cleaner location is actually limiting your engine’s ability to generate maximum power. And if you’re using a high-rise manifold that limits underhood clearance, instead of having to fit an air scoop, a low profile or an ultra low profile Spectre universal air intake system will provide hood clearance as well as increased performance. All of the Spectre universal intake systems draw intake air from the front of the vehicle where it’s not been contaminated by intake heat sources like the radiator and headers. Manufactured from high quality polished four-inch diameter aluminum tubing, these air intake systems are available in single and dual plenum and V6 and V8 motors fitted with throttle body fuel injection (TBI). Spectre offers several different styles of air boxes and inline air filter housings to meet your specific air induction needs. These air boxes offer an enclosed housing for the air filter that is designed to help block engine heat. 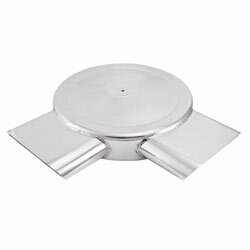 Our 16-inch and 14-inch low profile round air boxes are available in single inlet or dual inlet openings that are set at 120 degree, 135 degree, 150 degree, or 180 degree separation between the openings to mate with your air intake configuration. These inlets are designed to accommodate different air intake tube and engine configurations, and come in a polished aluminum or chrome plated finish. Spectre also offers 14-inch snorkel low-profile air boxes that feature high quality polished aluminum and are available in three different styles: a single 10-inch by 2.4-inch oval opening, dual openings set at 90 degrees, and another with dual openings set at 180 degrees, both with 8-inch by 2.4-inch oval openings, providing better airflow than a filter housing with two four-inch round inlets. Spectre also offers inline air boxes that give you the flexibility to remotely mount the air filter and housing away from your engine when space, access, or heat is an issue. Spectre inline air boxes can be located away from engine or even as part of a snorkel system for off-roading. Spectre offers inline air boxes with three sizes: three-inch inlet with a four-inch outside diameter, four-inch inlet with a five-inch outside diameter, and five-inch inlet with a six-inch outside diameter. 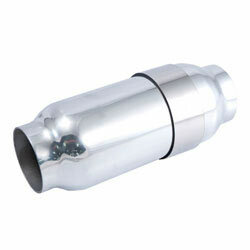 These housings have a polished aluminum finish and come with a high flow inline cone air filter. Each of the air box assemblies feature a Spectre HPR washable and reusable air filter. Manufactured using high quality materials throughout including washable synthetic media, so you shouldn’t ever need to purchase another disposable paper filter for your car, truck, or SUV. 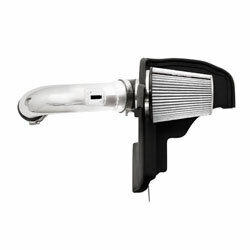 Spectre offers a vast range of intake components for custom car and truck builders to facilitate the construction of a unique designed cold air intake system. 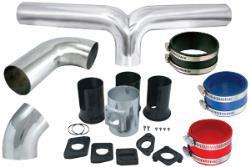 Available products range from air ducting components in three-inch and four-inch diameters, aluminum tubes in 2.5” to 5” diameters, a wide range of mounting brackets and mounting plates, couplers and reducers, clamps, air inlet funnels, including ones that replace headlamps, velocity stacks, single and dual plenums, and components for mounting and wiring mass air flow sensors. Virtually everything a builder would require to install a custom cold air intake system.